The game I am going to try to make for Nov 11th (or expanding to EOY if necessary) is called Up High, and it’s about a bear on a mountain trying to get to the highest point possible. Eight power-ups are placed precariously throughout the game world, each doubling the bear’s jump height from what it was before. The bear goes from jumping only one half of a tile’s height — not enough to clear any obstacle — to one tile, then two, four, eight, sixteen, 32, 64 and finally 128, the last of which overshoots the entire game map. Holding the jump button causes a jump meter to charge in the HUD, which determines how high the bear attempts to jump. 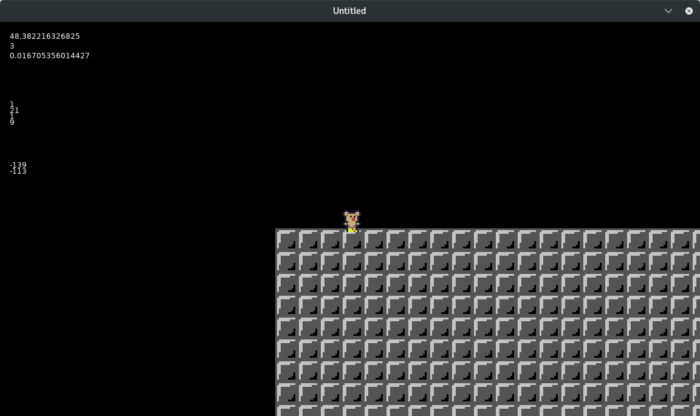 (Once one powerup is obtained, the minimum jump is the height of one tile.) The game is won when the bear performs the highest jump possible from the highest point on the map. Gameplay components must be kept to a small set of minimalist hazards and game pieces, if I hope to get this finished in time. No bosses are planned, and the player will have no direct capabilities beyond walking horizontally and jumping. I would usually work at a base tile resolution of 16×16, but I’m going to try 12×12 for this project, which I don’t think I’ve done before. This divides cleanly into 384×216, making for screens at are 32×18 tiles in size. There will be no scrolling, and the display will be locked in a flick-screen manner. A wide aspect ratio with high jumps may be a problem, but I’ll have to get further along in the project to understand if a change of plans is necessary. It’s been a busy week and I am pretty tired, so I don’t have much that I feel is important to get off of my chest right now. I will say that many of the concerns I floated in previous posts are higher up on the “Video Game Hierarchy of Needs” and I am not even remotely at the point where I can properly address them. But that’s OK. I’ll just keep trying to make progress when and where I can. Try to finish Up High by 11 Nov 2018. If unable to, try to finish by EOY 2018.